“Quid Pro Quo” is a Latin phrase that means “this for that” which really gets to the heart of what Constantine is all about. There’s often talk of how when it comes to magic in the world of this show, “there is always a price” and we get to see a lot more of that price in this episode. We also get to see a lot more of the backstory of Chas, why he is so loyal to Constantine, and how he is seemingly immortal. 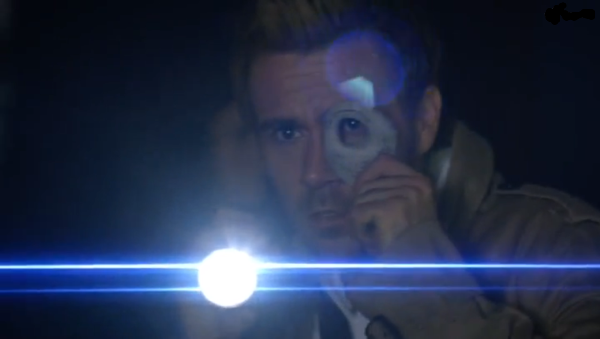 While there is several mentions of the rising darkness, this felt much more like a one-off episode that didn’t really further any of the season-long plot lines, but it is a really great character piece that shows how far both Constantine and Chas have come over the past couple years. And it does so without getting into Newcastle any futher aside from one throwaway mention. Chas is a character who I enjoyed well enough in the Keanu Reeves movie even though he was played by Shia Lebouf. He was basically comic relief, though he did get a couple moments to shine, and then he promptly died at the end. Here, he’s played much more like an old and loyal friend, pretty much the only true friend that Constantine still has. Charles Halford does a nice job at making him likeable, but he also generally stays in the background unless he has to sacrifice himself for one reason or another. Here, we finally get to see a bit more behind his character as he comes home to spend the weekend with his young daughter from a broken relationship. But when he gets home, he finds her in a coma and eventually realizes that her soul has been taken from her along with dozens of others in the area. We also get to see the genesis of his survivability which was the result of a drunken protection spell that happened to be cast at an opportune time. It was a spell from the Arthurian legend which would protect a knight of the round table by absorbing the spirits of the lesser knights who had fallen. Here, Chas dies in a nightclub fire along with 47 other patrons whose souls he has absorbed. The surprising thing is when it’s revealed that he still has 31 of those souls left, considering the course of the show I would have imagined he would have died well over those 16 times over the course of two years working with John. This brings me to another thing I don’t quite understand; how John continues to have so many “friends” and contacts throughout the country when nearly everyone who helps him in the course of the show ends up dying. Here, we get to see a medium who is now running an Army surplus store in New York. When trying to find the soul of Chas’s daughter Geraldine, he ends up getting possessed by the mage behind it all and is burned to a crisp. Which brings me to the “quid pro quo”s of the episode, the first one is when they face the elder mage Felix Faust. He gets them to help him out by getting rid of a sleep demon who has been feeding on some of the souls’ bodies which doesn’t help him out very much. The banishment of the demon in return for Geraldine’s soul. Of course, nothing is that simple and so Chas decides to take things into his own hands by offering the souls of those left within him for the soul of his daughter. There’s also the burden of responsibility that Chas has over having his ability in exchange for those 47 people who died two years ago. Not to mention how Chas essentially has to sacrifice his family life in exchange for the services he performs with Constantine in order to help fight against the rising darkness. And on top of everything else, Zed gets to reveal a touch of her backstory, she gets to expand her abilities and pay the price associated with that, and also has several small moments throughout the episode to show her worth to the team. Overall, it was a great episode and one of my favorites so far this season especially since no one really close to Constantine had to die, aside from that random medium introduced only a few minutes before his demise. This was one of the better episodes, but as far as showing us the back story between Chas & Constantine, it still left a lot of questions. It seemed it was more of an ‘origin’ story for Chas and his ‘immortality’, than showing us their relationship, as they already seemed to be friends even at the beginning of the flashback. So Chas knew about Constantine’s magic stuff, but just was never a part of it? And how Constantine essentially goads him into being his partner… I felt the whole thing was like a foregone conclusion than Chas actually having to struggle with the burden. I did love how Chas handles Felix in the end and Constantine fully backs him up at the last minute, that is more when I felt like they were besties than any other scene. I liked the last scene with Zed before she doses off, which adds a great element to the next episode and Constantine’s character. Yeah, I agree that it’s not exactly a lot of insight between Chas and John’s relationship. But it was interesting to see how he is able to do what he does and that it is, in fact, finite. The last scene with Zed and John was fantastically simple and just completely perfect for the two of them.